Malta might be one of the world’s smallest countries with an area of only 316km2, but what Malta lacks in landmass it makes up for with azure water, ideal snorkelling locations, water sports and activities on a wide array of beaches, and a multitude of rocky inlets just waiting to be explored. Malta might be one of the world’s smallest countries with an area of only 316km2, but what Malta lacks in landmass it makes up for with azure water, ideal snorkelling locations, water sports and activities on a wide array of beaches, and a multitude of rocky inlets just waiting to be explored. While many of the sandy beaches in Malta are quite busy in summer, particularly on the weekends, with a little exploring, many an idyllic sunbathing and swimming spot can be found. So the question that remains is simply, once you’ve arrived and unpacked your swimming gear and grabbed your beach towel, to where should you head? The small size of Malta means that wherever you are on the island, you are never far from the next swimming spot. The southwest facing side of Malta is where the majority of sandy beaches are found, whereas the northeast facing side is largely constituted of rocky coastline, which is nevertheless a favourite area among beach-goers and sun worshippers. In fact, the rocky stretch from St. Paul’s Bay to Bugibba and Qawra is spotted with several access points for swimmers. In the peak of summer many sunbathers gather to relax on the rocks and jetties in Bugibba and Qawra, as the large swimming area is ideal for all swimmers as well as being very closely located to all sorts of touristic amenities in the seaside resorts. The most popular of Malta’s beaches are Ghadira Bay (also known as Mellieha Bay), located in the north of the island. The beach is the largest and most accessible sandy beach in Malta, and is easy to get to by public transport. With ample sun beds, deck chairs, and umbrellas to rent, the beach is a firm favourite among families, particularly due to the lagoon-type water that remains shallow for quite a distance out into the sea. The edge where the water meets the sand is a site of constant sandcastle building and beach ball playing with smiles and laughter all around. For those that would rather avoid the crowds, setting off across the rocks on the edge of Ghadira Bay is the perfect opportunity to explore secluded swimming and snorkelling spots. Alternatively, wandering down the hill from the Selmun Palace, just near the village of Mellieha, will take you to a small and tranquil sandy beach called Imgiebah Bay. You can also drive down to the bay, but be warned that the road is a very narrow country lane that can be quite tricky to navigate, especially in large cars, and the beach does not have any amenities offering drinks or snacks. Paradise Bay, in the very north next to the Cirkewwa ferry terminal from where ferries take off to Comino and Gozo, is set in a natural cove and is excellent for snorkelling. The sandy beach is quite small, but due to its isolated location, crystal clear turquoise water and wide range of facilities (including some water sports), Paradise Bay is quite a well-frequented beach at the weekends during summer. Located not too far from Paradise Bay, are the two small sandy beaches of Armier Bay and Little Armier. The bay has a stunning view across to Comino and the crystalline sea is ideal for families. Armier is quite cut off and is most conveniently reached by car. However, due to its secluded location, Armier is calm, peaceful and mostly frequented by locals, particularly on summer weekends. 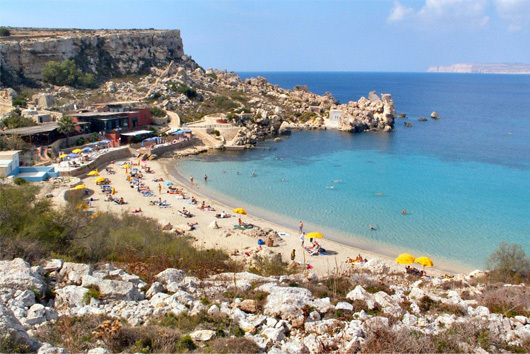 Most Maltese will claim that the two bays of Golden Bay and Ghajn Tuffieha Bay are their favourites on the island, and for good reason. These two attractive beaches are located right next to each other on Malta’s southwest facing coast. 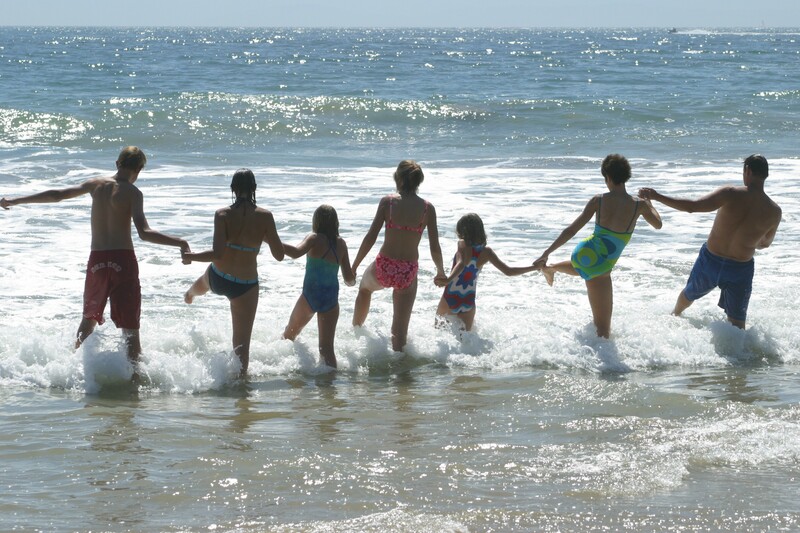 Both beaches have rich golden sand, clear water with a sandy bottom, and water sports and snack facilities on the beach. They are also both easily reached by car and public transport. Both bays are excellent spots for sunbathing and swimming, and Golden Bay also offers great dining due to the 5* Radisson Blu Golden Sands Resort. Ghajn Tuffieha is a little smaller and takes a bit more effort to get to due to the long, steep staircase that winds down to the beach. However, this also means that, even though both beaches can be quite busy during summer, Ghajn Tuffieha is normally the quieter option especially during the week. Behind the beach at Ghajn Tuffieha are walking paths that lead to other tiny beaches and inlets for those willing to hike a little way to complete isolation. The southwest facing location of both beaches also makes the area a perfect location from which to take in Malta’s breathtaking summer sunsets. Located not too far along the coast from Ghajn Tuffieha and Golden Bay and just past the village of Mgarr is Gnejna Bay. This is one of the most serene parts of Malta and the beach in Gnejna is where many local families while away their summer weekends and after-work afternoons. The beach is sandy but the bay has also got large areas of flat limestone where people can sunbathe and relax away from the sand. Even though it can get a little busy at the weekend, Gnejna Bay is still one of the quietest and most peaceful beaches in Malta and a great location for families with children. If Gnejna Bay still isn’t quiet enough, a short drive from Mgarr is Fomm ir-Rih. This bay is the definition of what it means to go off the beaten track in search of solitude. Fomm ir-Rih is very remote and quite inaccessible. The cliffs that fringe the bay can only be accessed by car and the beach is located at the bottom of a tricky footpath, making it quite inappropriate for small children but much loved by adventurous hikers. The bay itself is idyllic and perfect for snorkelling and, while the pebbly beach is quite small, it slopes into the refreshing Maltese sea. Perhaps the only point of concern here is that care should be taken under the midday summer sun due to the lack of shaded areas. The further south one travels along Malta’s southwestern coast, the more inaccessible the water becomes due to the high imposing cliffs that span this part of the island. That said, the deep blue water here is an enticing sight. One access point to the water on this side of Malta is Ghar Lapsi, which is less of a beach and more of a hidden cove nestled into the cliffy landscape and particularly popular among local fishermen and snorkellers. There isn’t much space for sunbathing, but the bay is very popular among those looking for a good swim in the stunning surroundings with a view out to the open Mediterranean Sea. The southern end of Malta has a few beaches and bays that are very popular with locals. St. Thomas’ Bay, near the town of Marsaskala, is quite secluded and has a rocky coastline with a few sandy banks. The bay is a fishermen’s cove and a handful of restaurants there offer delicious fresh fish. Quite close to St. Thomas’ Bay is St. Peter’s Pool, a rocky inlet with crystal clear water of the Mediterranean mix of turquoise and blue. St. Peter’s Pool is a little difficult to get to and not really suitable for inexperienced swimmers, but the flat rocks offer a wonderful sunbathing area, and adventurous swimmers will enjoy the possibility to jump into the shimmering water from rocks at the height of a few metres. A short drive from St. Peter’s Pool is Pretty Bay, the only completely sandy beach in the south of the island. The bay is located in Birzebbuga and is well frequented by families as well as those after fun water sports and beach activities. The commercial and touristic centre of the island – St. Julian’s and Sliema – should also not be overlooked when it comes to swimming. The coastline along St. Julian’s and Sliema is of flat limestone rock that is ideal for sunbathing and there are many access points from which to get into the deep blue water. St. George’s Bay, a sandy beach in St. Julian’s, is a charming bay and a great alternative for those swimmers after a more sheltered beach from which to swim but still remain close to the touristic centre in St. Julian’s and Sliema. The facilities offered all along this stretch of coastline are second to none as the centre of activity throughout the year. With warm temperatures in spring and autumn and under the summer heat, the bays and beaches across Malta are well worth a visit. While some bays and beaches are harder to get to than others, with such a collection of pristine beaches and bays, spectacular sea views and clear water, it is hard to fault Malta as a destination for a worthwhile Mediterranean beach holiday. Gozo is much smaller and more remote than Malta, but offers the visitor to the island splendid views, rich countryside, and sheltered bays and beaches waiting to be enjoyed. In spite of its small size, Gozo has quite a variety of beaches ranging from popular sandy beaches to hidden coves and secluded inlets. Since it is quite cut off from Malta and only reachable by ferry, the beaches on Gozo tend to be less overcrowded than beaches on Malta, but still draw large numbers of tourists and locals on summer weekends. As one of the most outstanding beaches in the Maltese Islands, Ramla Bay is the biggest and most popular sandy beach on Gozo. The golden red sand covers a stretch of about half a kilometre. The beach is enclosed by Gozitan countryside on surrounding verdant hills creating a lovely view when driving down to the beach from the village of Nadur. The water remains quite shallow and, with umbrellas, sunbeds and deck chairs for hire and ice cream and snacks on sale during summer, the beach is ideal for all kinds of visitors. The next bay to the east of Ramla Bay is San Blas Bay, which is also reached through Nadur. San Blas is a small and secluded alternative to Ramla Bay, set in the green countryside and rocky landscape on Gozo’s northeastern coast. The red sandy beach is reached on foot along a steep path at the end of the road leading down to the bay. The beach is unspoiled and the crystalline water is perfect for snorkelling. 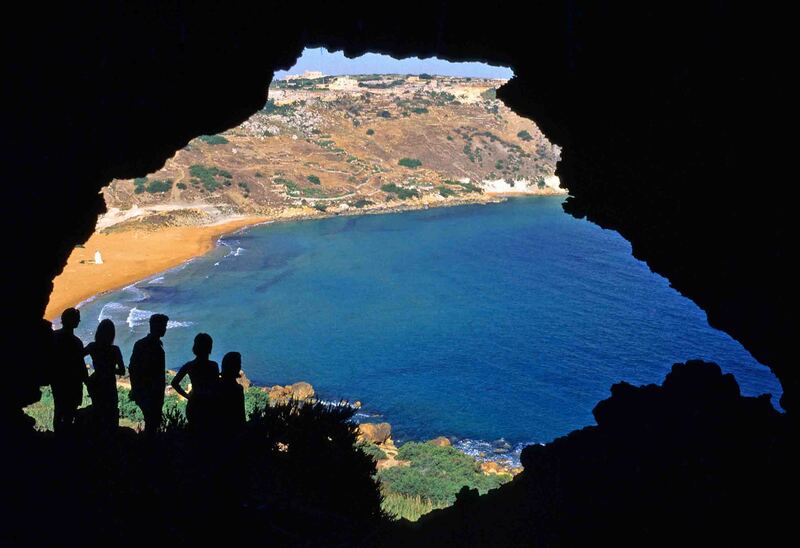 Another of Gozo’s most popular bays is Marsalforn Bay, which lies between the villages of Xaghra and Zebbug. With many dining and water sports facilities right on the water’s edge, Marsalforn Bay is Gozo’s thriving summer resort hosting a large number of both foreign and Maltese tourists during summer. The village is one of Gozo’s main fishing villages and has a number of renowned restaurants offering fresh fish and local cuisine. 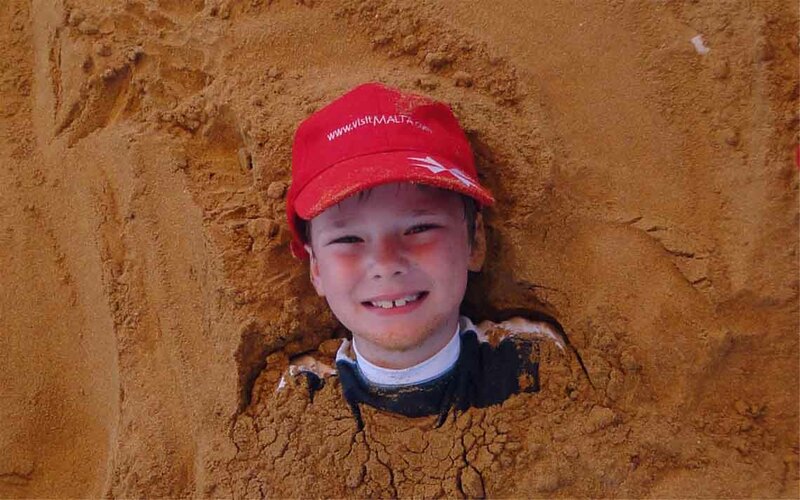 The bay itself has a sandy and pebbly beach as well as rocky areas from which to enjoy the swimming zone in the bay. The two small and neighbouring bays of Qbajjar Bay and Xwejni Bay are located less than a kilometre to the west of Marsalforn Bay. These are two shallow bays with small pebbly and rocky beaches that disappear into clear blue water and then further into the open sea. The shallow rocky bottom makes this an ideal area for snorkelling and is excellent for swimming. The Qbajjar saltpans are also a short walk away and the handful of bars and restaurants on the seafront are ideal for a spot of lunch out of the hot summer sun. Gozo’s most photographed landmark, the Azure Window, unfortunately collapsed in March 2017 and was located in Dwejra. The beach remains a favourite among divers and many people will still go to see this once famous land mark and take a dip in the refreshing water. The outer sea in Dwejra is deep and reached down a cliff path, a favourite among divers. The Inland Sea in Dwejra is a sheltered alternative, linked to the outside Mediterranean through a natural arched tunnel hewn through the cliff by rough waves of old. The area is quiet with a small bar selling snacks, drinks and ice cream during summer right on the edge of a pebbly beach that leads into shallow lagoon shimmering in the summer sun. Gozo’s most photographed landmark, the Azure Window, is located in Dwejra. The area’s picturesque rock formations also make it an attractive location in which to have a refreshing dip. The outer sea in Dwejra is deep and reached down a cliff path, a favourite among divers. The Inland Sea in Dwejra is a sheltered alternative, linked to the outside Mediterranean through a natural arched tunnel hewn through the cliff by rough waves of old. The area is quiet with a small bar selling snacks, drinks and ice cream during summer right on the edge of a pebbly beach that leads into shallow lagoon shimmering in the summer sun. On the southwestern coast of Gozo lies Xlendi Bay. This scenic inlet is located at the end of a valley and is fringed by majestic cliffs. The small sandy beach is a lovely swimming spot and the resort is well equipped with tourist-oriented amenities, including restaurants, bars, and holiday accommodation. This is also a stunning place from which to enjoy Gozo’s warm summer sunsets. To the east of Xlendi Bay and on Gozo’s southern coast are the two bays of Mgarr ix-Xini and Xatt l-Ahmar. Mgarr ix-Xini is a secluded inlet, ideal for swimming and snorkelling. There is a small pebbly beach on the inner end of the inlet that gently slopes into the water. Xatt l-Ahmar is also a great swimming and snorkelling spot, with a handful of boathouses used by local fishermen. The small narrow lane that leads down to this beach ensures that Xatt l-Ahmar is rarely busy and always peaceful. Another popular swimming site in summer is Hondoq ir-Rummien. Reached through the village of Qala, this small sandy beach dips into crystalline turquoise water and is very popular with local swimmers and sunbathers, even getting quite crowded at the weekend. In summer many locals stay on late into the evening firing up barbecues and relaxing in the smooth summer breeze. While the more popular beaches and bays are well connected by public transport, a number of beaches in Gozo are very secluded and best reached by car. That said, this should not put you off exploring the more isolated beaches on the island, as a summer day lazing in the Gozitan sunshine is always worthwhile and will make you want to extend your stay on Malta’s sister island indefinitely.